Surrounded by the popular destinations of Southeast Asia and isolated from the rest of the world for years, Laos is often overshadowed by its neighboring countries. It's more likely a tranquil and mysterious corner, and just a few of you put it in the travel list. However, with untouched beauty, Laos is a big thing for you if you are a laid-back traveler: from brilliant pagodas to ancient heritages, from breathtaking waterfalls to the idyllic Mekong River. It's surprisingly gorgeous. I bet no place in Laos is more popular than Luang Prabang. Once called as "the last refuge of lovers and dreamers", Luang Prabang lies in the valley where the Nam Khan River flows into the Mekong River. It was the royal capital of the country until 1975 and declared as a UNESCO World Heritage city. It has many Buddhist temples, including Wat Xieng Thong, Laos' most enchanting temple, and Wat Mai, the former residence of the head of Laotian Buddhism. Feeling Laos' local life is another absolute highlight of the tour. 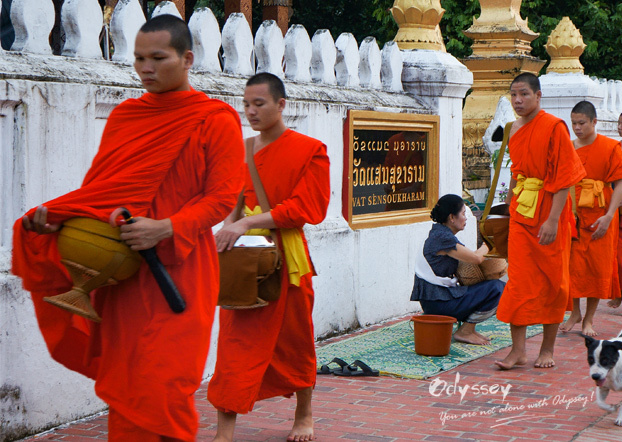 Opt to get up early to witness the Morning Alms-giving Ritual – the most sacred Laos' tradition, go to the night market that is a great place to mix with the locals and take some souvenirs back home. However, Luang Prabang is not all about it. 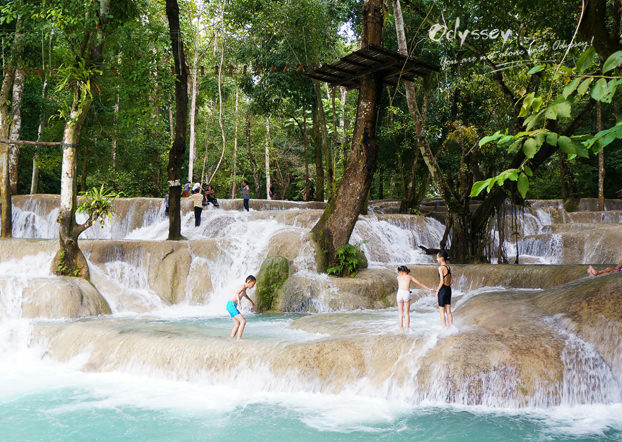 You may also lose yourself in the timelessness of the nature in many ways: a cruise upstream on the Mekong River, a visit to the impressive Kuang Si Waterfalls, where you can cool off with a refreshing swim in the pools, or a climbing to the top of Mt. Phousi for a panoramic view of the city and the orange sunset… Which ones you like most? 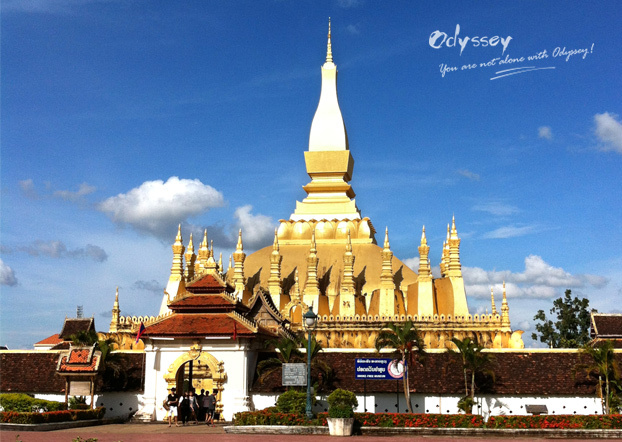 Laos' largest city, Vientiane, can never be missed from your list. Although this is the largest city in this country, modernity still fails to speed it up. Vientiane retains its relaxing charm with low buildings, old Buddhist temples, and outstanding French colonial architectures. If asked what is the most important thing to do in Vientiane, I would say getting an insight to the Buddhist heritage, since it's blessed with a large number of Buddhist wats. Among the many amazing wats, three of them stands out. The first one is Great Sacred Stupa, namely That Luang Stupa. Built by a Laotian King in the 16th century, this stupa is the most important national cultural monument and symbol of Laos. Wat Si Saket is the second one that I recommend you to visit, as it is the oldest temple with thousands of miniature Buddha statues. The last one is Wat Ho Pra keo, which was a former royal temple and housed the famous Emerald Buddha Image in the past. Today, Wat Ho Pra keo is a museum rather than a religious venue. Alternatively, let's walk to Patuxay Monument. Patuxai literally means Victory Gate, dedicated to those who fought in the struggle for independence in 1949. 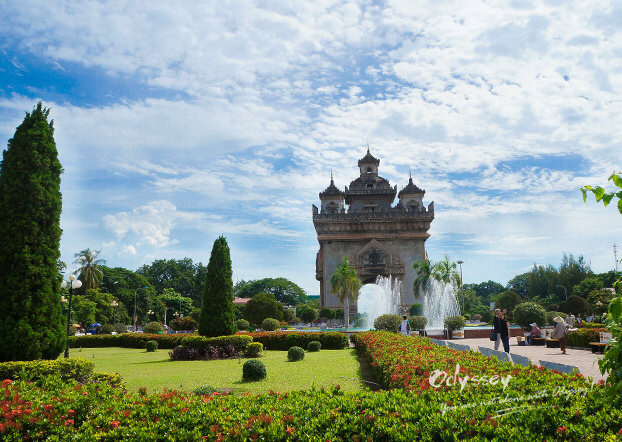 It is now becoming one of the iconic attractions in Vientiane, attracting a large number of visitors every year. Well, every corner in Vang Vieng looks like a scene from a postcard. I'm not bluffing. Vang Vieng is embraced by dreamlike Karst mountains, underground rivers and scenic cliffs, and it guarantees an awesome experience for adventure lovers. 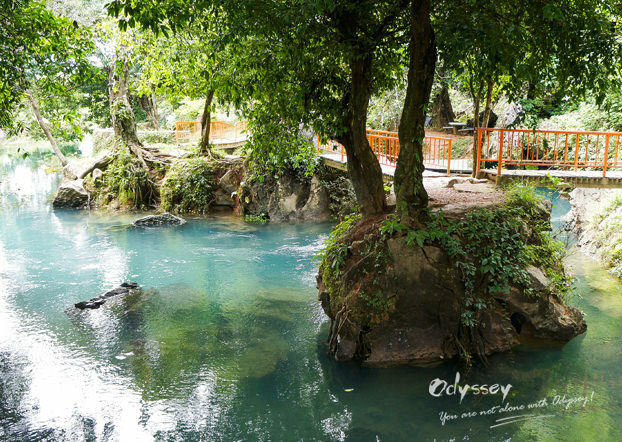 Blue Lagoon and Tham Phu Kham Cave are very alluring for most of you. Blue Lagoon is a small lake with a color of pure blue as its name suggests. This is a perfect place to swim during the hot seasons; what's more exciting, there is a tree hanging over the lagoon from where you can take an excellent jump into the clear water. Trek about 10 minutes up into the Tham Phu Kham Cave, you'll find a main cave chamber containing a reclining Buddha statue in the middle, from where several galleries branch off deeper into the mountain. If you decide to stay in Vang Vieng for a couple of days, there are many activities to do, and you'd better experience these one by one: having a tubing trip or kayaking in the Nam Song River, visiting Tham Jang Caves, taking a hot air balloon for the iconic Karst landscape, cycling around the town, etc. Xieng Khouang boasts the most distinctive and enigmatic attraction in Laos – the Plain of Jars. These giant jars, believed to be over 2,000 years old, were made from very hard stone, mostly granite, and some are carved from sandstone. As you wander through hundreds of giant jars, you'll immerse yourself in mystery, because no one knows the reason why they are here. Some people say these jars were used to ferment rice wine for victory celebration, while others believe that they are used to collect monsoon rainwater for carven travelers. Whatever the reason is, it's an incredible place to visit. Then, venture to Muang Khoun, the provincial capital of Xieng Khuang during French colonialism. Despite being damaged by wars, a handful of aged monuments still survived. And together with its quaintness, this place worth a detour for those who stay in the region for several days. Pakse, sitting at the confluence of the Mekong and the Se Don River, is the capital of Champasak Province and well off the beaten track in Laos. Different from the splendor Luang Prabang, Pakse has its own charm with friendly locals, relaxing atmosphere and historical wats. When you're about to explore surrounding attractions, Pakse serves as an ideal base. Many travelers come to Pakse for the nearby Bolaven Plateau Area, a home to dozens of waterfalls, fantastic sceneries, fascinating tribal villages, and coffee and tea plantations. Located in an ancient volcano that erupted millions of years ago, it reveals the most beautiful scenery in Southern Laos. While excursing at the Plateau, you may also pay visit to the village of ethnic minority group for local life. This province is also known for the spectacular Khmer ruins at Wat Phu and the stunning Si Phan Don (4,000 Islands) near the Cambodian border.  So, I suggest you spend more days in Pakse for your further exploration in this province. What's your impression of Laos? You can share this article and tell your friends about your opinion after reading it; or if you are planning your trip to Laos now, just let one of our experienced travel consultants a special insight tour for you. For me? It's really a big thing for laid-back travelers!